Rimadyl, aka carprofen, is a long-acting non-steroidal anti-inflammatory drug (NSAID) that is used to ease arthritic pain in dogs. 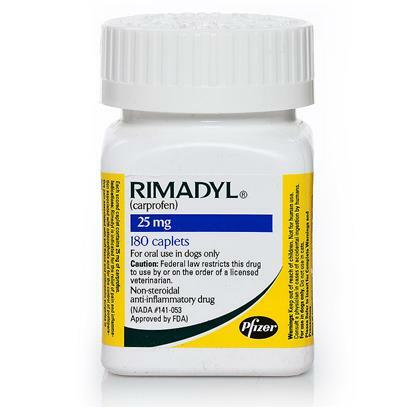 Rimadyl for dogs is the most prescribed drug in the world for this canine ailment. Rated 5 out of 5 by 183 reviewers. The chewable version makes life easier! This product is great for dogs with sore knees. This product has helped ease the pain in my dogs hip. It works well and fast. This product turned my dog around. Great so far for my 12 1/2 year old lab. Hoping it works even better as the days go on. Only get the CHEWABLE version ! my senior dogs love this. This product works well for athritic pain. Rimadyl has kept our very elderly Golden Retriever still able to climb the stairs into and out of the house. This medication is like a wonder drug for my dog. This product seems to help.